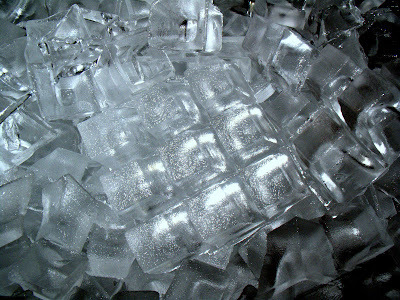 CIOPhoto: 135 - Ice, Ice Baby! No it's not diamonds, it's really ice, you know the cold stuff. We were visiting a Frank Lloyd Wright Usonian home recently and they had an 1940's refrigerator with the old aluminum style ice trays. The docent told us kids have no concept of making ice in ice trays. One even asked what the recipe for ice was. So the ice machines have it. Canon G10, 1/60 sec at f/6.3, ISO 400, contrast highly exaggerated. Hey thts really nice..good work..keep it up...! !